What fun it was to challenge myself with a product that I have never used. 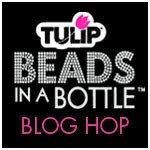 I anxiously await "hopping" through the blogs in this group to discover amazingly creative ideas. 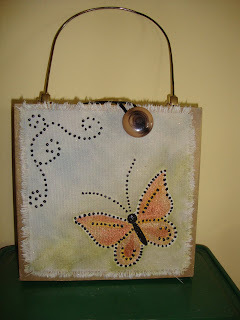 My projects combined some of my other favorites: Sizzix dies, felt, buttons, fabric and altered art ideas. Never having used this product before I know that it would take some practice. After some practice runs to get the "right feel" for forming the beads I created a few very simple items. After die cutting two shades of aqua blue felt into flower shapes, I used only one color of the Beads in a Bottle to outline the pieces. Once the beads were dry, the flowers were created and completed with a button center and felt leaves. The flowers were glued to a narrow strip of felt. This is then attached to a stretchy headband. This strip had a small Velcro closure attached, to make the flower accessory changeable. Another similar hair accessory was made again by using felt, die-cut flower shapes. Just by using only two colors of the Beads in a Bottle, another look was created. The flowers were then glued onto a ribbon covered headband. To coordinate with the "red,white and blue" headband, just perfect for celebrating the 4th of July, I used a very simple design on a T-shirt for my granddaughter to wear for the holiday. Used Sizzix star die-cuts as a template and laid down masking tape for the red lines. 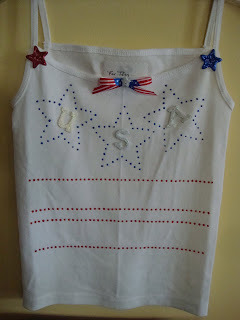 Finished off the look with star buttons and "stars and stripe" ribbon bow and fabric glued letters. Finished off with a cigar box purse, collaged with papers on three sides and a canvas square on the front. The shape of the butterfly is made with another Sizzix die. Free form scrolls designs with black "beads in a bottle". I used Tulip fabric paints for coloring the butterfly and watered down inks for a light background. Misted the entire canvas with gold Tulip glitter spray paint. I like the look of a single color and simple lines but I would like to attempt a more intricate design with multiple colored "beads". I did "love to create" with this fun product! Wow! So many great projects. Really fantastic. Love ALL that you did with the Beads in a Bottle! Fantastic projects! You really went all out testing different surfaces! Very cute ideas! I especially like the purse. Madeline, Great projects, you are so creative!